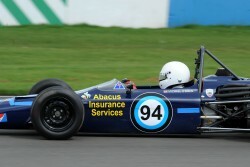 The historic Formula Ford racing season got underway at Donington on April 6th. and both Speedsport prepared Merlyns were in action. Michael O'Brien, starting only his third ever motor race qualified second in wet conditions, and after a poor start fought his way back to third by the flag and also set the fastest lap of the race. Team mate Josh West qualified third, and after an eventful race finished a spirited fifth overall. Michael also competed in the 'Classic Racing Car' event, qualifying second overall and finishing fifth against much more powerful opposition, easily winning the HFF class in the process. Next event is Thruxton over Easter weekend.